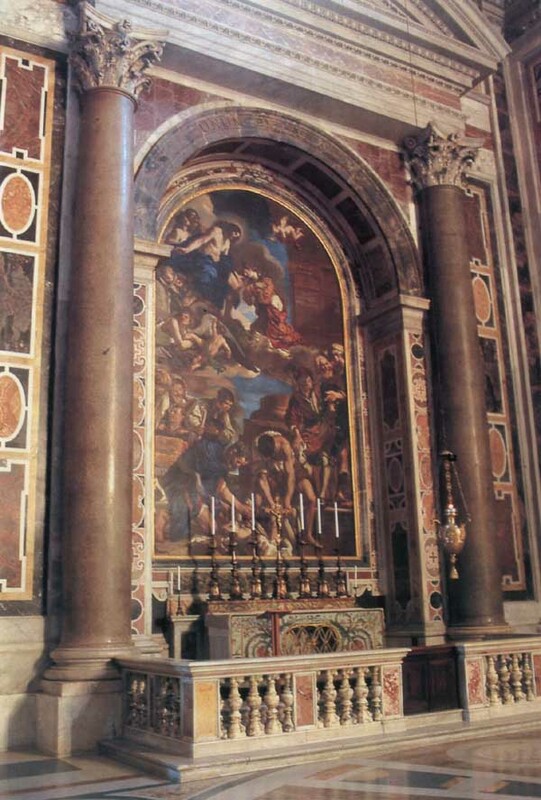 The altarpiece, Burial of St. Petronilla, is after a painting by Guercino. She was the legendary daughter of St. Peter. The saints relics came from the catacombs in 750. Her chapel in both the old and new basilica became the Church of France. 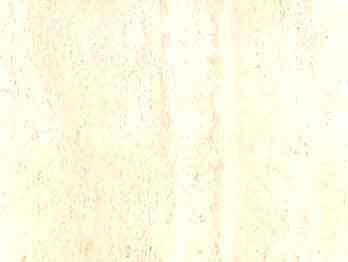 This mosaic is after a painting by Barbieri. The altar contains relics of St. Petronilla, who was martyred for refusing to sacrifice her virginity by marrying a nobleman named Flaccus. Her relics were removed from the Catacombs of Domitilla in 750, and transferred into the Chapel of the Kings of France, Pepin and Charlemagne, in the old basilica. Petronilla was the legendary daughter of St. Peter, and France - traditionally called the "eldest daughter of Holy Mother Church" - has long had a special devotion to her. To this day, the French community gathers at this altar on May 31st to venerate the saint. The altar at the back is dedicated to St. Petronilla. On it can be admired a scene of the Burial of St. Petronilla, who is received into heaven by the heavenly Bridegroom, one of the loveliest mosaics in the basilica. It is by Pier Paolo Cristofari after a painting by Giovanni Francesco Barbieri, known as Il Guercino (1590-1666). Under this altar are the relics of St. Petronilla, whose body, buried in the cemetery of Domitilla, was exhumed in 750 and venerated in a small shrine which Pepin le Bref had requested from the Pope and was therefore known as the "Rotunda of St. Petronilla". When the saint's body was translated to St. Peter's basilica in 1606, it was this little chapel that became the national Church of France. Here, on May 31, the French community gathers solemnly to venerate the saint. The other altarpiece in this chapel is based on a much more complex and original composition, created in 1730 by Pietro Paolo Cristofari from the large canvas by Guercino, now in the Capitoline Pinacoteca, representing St. Petronilla's Exhumation and Glory. 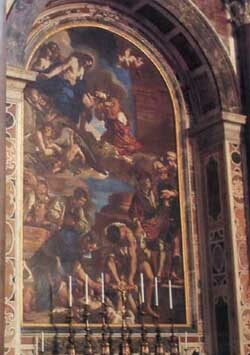 This transposition in mosaic was among the first carried out in St. Peter's, and is in any case a masterpiece in the whole series, due to the intrinsic value of the painting and the sensitive skill of the mosaicist in faithfully maintaining the chromatic and chiaroscuro relations, as well as the plastic and linear effects of the original, thus succeeding in perfectly rendering the dynamism of the composition and the pictorial and expressive intensity of the various figures in all their details. This altar, which from 1606 contains the remains of the Saint, can be considered to be the heritage of the devotion of the kings of France and of their people to the Roman Catholic Church and to the Basilica in particular. It, in fact, replaces the round imperial construction situated on the left side of the old St. Peter's, where the body of the Saint (perhaps a descendent of the imperial stock of the Flavi) was originally placed. It was elected by the French sovereigns, from the Carolingians up to the Valois, as their national church, enriching it with donations and providing for its restoration, until it was demolished, by order of Julius II to make space for the New Basilica. The original painting of 1623 by Giovanni Francesco Barbieri ("Il Guercino") is now in the Capitoline Picture Gallery, Rome. In 1725-26 Sebastiano Conca was paid to do a cartoon after the picture for the mosaicists. Pietro Paolo Cristofari began the mosaic on the basis of Conca's cartoon, but at some point he rejected it in favor of the original picture. He was paid for the mosaic from July 1728 to April 1730.